On Thursday, HA2/3 played away at Loughborough. On paper, Loughborough were far stronger giving us a huge handicap advantage. Gary and Drew had their work cut out and both lost quite early. 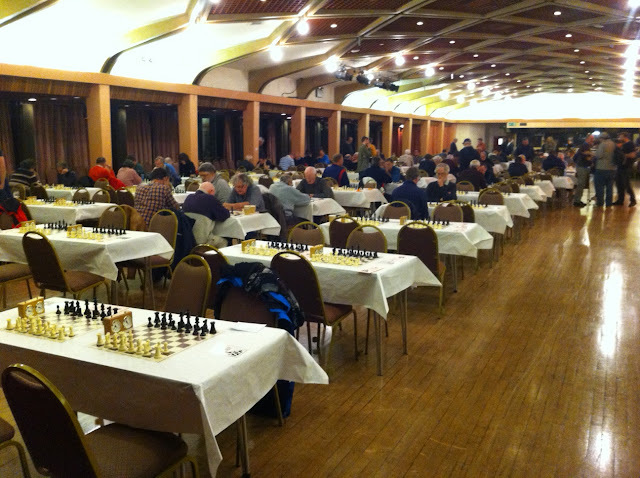 I managed a win against Sam Gallant in a really sharp Ruy Lopez. Having won a rook early on, my queenside was undeveloped and my kingside came under attack and things could easily have gone in favour of my opponent. Ray then drew with Terry Adcock. This coming week, HA1 play at home on Tuesday against Melton Mowbray 1. Also on Tuesday, HA3 play away against Syston 4. On Thursday, HA2 play away at Ashby 3. Things did not go well at home either on Tuesday. On Thursday, HA2 scored three draws and a loss away at Loughborough. John and Pete had both been slightly better. 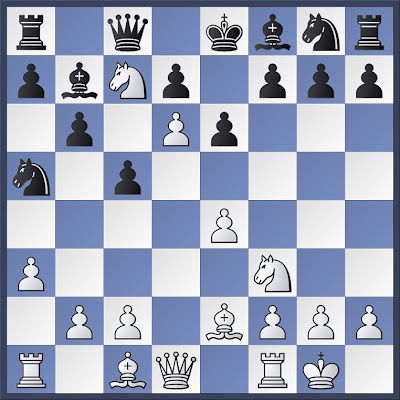 Ray had the opportunity to swap off a knight for a rook, but did not take it and was mated a few moves later. and on Wednesday, HA2/3 are away again at Loughborough. Tonight (Tuesday 13.11.12) HA1 play at home against Ashby 1, and HA3 play away against Braunstone 5. On Wednesday, HA2 play away against Loughborough 2. This website has had 290 pageviews during the last week - six of them from Russia. Good luck everyone, and send me your games. I was one of four drivers, and took Mick Busby, Parin Suchak and Charles Eastlake. The match was to be played at a halfway point, Wall, near Lichfield. Had a slight problem on the way. We were so busy talking chess that I missed the A5 turn off on the M69. We then backtracked from M6 to A5 as we didn't feel like paying a fiver on the M6 Toll. Luckily we had allowed plenty of time, and arrived 15 mins before start. Cyril was missing around five over 130 players, so we were again significantly outgraded. The match finished 11-4 to Shropshire, with one board to be adjudicated due to a draw claim under rule 10.2. I played board 4 against Graham Shepherd (137). He was on the back foot for much of the game, but I couldnt push the advantage home. I refused two draw offers, but when the match was lost I agreed. From memory we had only my draw and another on board 2 from Ian Farqharson in the top 8 boards, so we were well and truly sent home with our tails between our legs. The highlight of the day for me was on the journey home. Talking all things chess again. Parin told us that he had played Gary Kasparov in a 30 board simul. Not only that, but a few years ago he had met Vishy Anand in Delhi, and had played a one to one game with him! To have played against two of the greatest ever chessplayers. Wow! An excellent away win at Ashby with wins on four boards out of a possible five. If anyone would like to post a game, please send it on to me. A clean sweep at home for HA2. John scored an early victory. I then won. Mike won on time in a superior position when his opponent failed to make the first time control. 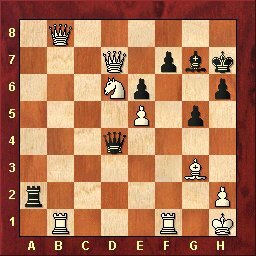 Pete had been up against it and had a Bishop and four pawns against a Rook and four pawns, but then his opponent put his rook on the same diagonal as his king. Pete apologised as he placed his Bishop in between the two of them. HA3 play away at Ashby on Thursday. Update, John's Raffle, and declining interest from Russia. Last Thursday saw a good win for HA1 away at Shepshed 1 and a surprise loss for HA3 away at Kirby Muxloe 3. Here is Drew's game. Fritz reckons that Drew first reached a won position on move 11 and that the position from moves 15 to 27 was also winning for Drew. Tomorrow (Tuesday 6th November) HA2 play at home to Wigston 4, and on Thursday HA3 play away against Ashby 4. The Grinder is raffling off a rather nice chess set for £3 a square. The pieces are Lewis Pattern Chessmen and they come with a wooden board (5cm squares, i think). An auctioneer recently valued the set at around £200. When all the squares have been accounted for, we will ask an independent player to draw the winning ticket. Proceeds will go to the club. Since we started referring to Ray as TPFKAR (The Player Formerly Known As Raymondov) instead of Raymondov, the number of visits that we have had from Russia has dropped off a cliff with no hits at all last week. Raymondov, Raymondov Raymondov - let's see if that improves things over the next seven days. I offered Mick Tate a draw on move 30 thinking that i had a slight edge and he accepted. Later on, however, i checked with Fritz and the machine thought that the difference was two and a half pawns. Next, John lost out to Paul Deacon, and then Pete beat Gavin Hart to make it 1.5 points each. The deciding game was Mike C Vs John Pattinson. Mike had queen and knight against John's two rooks and i think there were about three pawns each. Both were short on time, but Mike was shorter. Both kings were in exposed positions, John's rooks were working well together, and Mike's job looked far from easy. Mike was eventually able to swap off his knight for one of John's rooks. John resigned a short while later when Mike had a few seconds left on the clock.